A dedicated home office is great – you can set up your desk, storage, and (with a bit of luck) be able to close the door and get some work done. But what if you just don’t have that spare room available? Here are 5 tips on where you can find the space for an office. A home office doesn’t have to be a full room. If you have a small corner, nook, spot under the staircase, or anywhere else where there is room for a desk you can probably set up a mini home office. Check out our tips on How To Make A Home Office In A Small Corner if you think you have got a space you can dedicate. 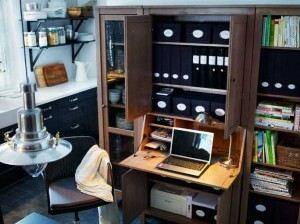 Ikea has some clever ideas to integrate workspaces in to a cupboard. Here we have a fully equipped workspace that in a few seconds can be closed away to look like just another piece of furniture in the room. This would be great for people who just can’t find any space at home to fit a desk, even a very small one. We all have a dining table at home, right? That’s a great place to work at: it’s large and often gets unused for all but dinner time. Storage can be an issue – your family might not appreciate computer cords, pens and paper spread across it. (and you might not appreciate them spilling spagetti sauce over your notes). The easiest solution is to create a portable stationery and filing cabinet. There are portable filing systems available from office supply stores but we like the idea of a small backpack. It’s small, zips up, and often the size is just perfect for a few key pieces of stationery and notebooks. Even if you don’t have a dining table in your tiny apartment, perhaps you have a bench or bar at the kitchen to work from. Bar stools can be a little uncomfortable, so try converting to a stand-up desk system. It will take a little getting used to (and probably some comfortable shoes) but most people who give it a go love it within a few days. Your body will thank you too! If the bench isn’t tall enough try propping up your screen with a few large books. If all else fails you always have your lap to work from. It’s free and it follows you where ever you go. Just make sure you get up and stretch every 30-60 minutes before you develop a hunchback. Here we presented five alternatives to a dedicated home office. When you think about it, they aren’t that different from working a cube at a commercial office – where you are lucky to get anything more than a desk, a drawer, and a single shelf.